Rotten Tomatoes Plot: In the near future, Major (Scarlett Johansson) is the first of her kind: A human saved from a terrible crash, who is cyber-enhanced to be a perfect soldier devoted to stopping the world's most dangerous criminals. When terrorism reaches a new level that includes the ability to hack into people's minds and control them, Major is uniquely qualified to stop it. As she prepares to face a new enemy, Major discovers that she has been lied to: her life was not saved, it was stolen. She will stop at nothing to recover her past, find out who did this to her and stop them before they do it to others. 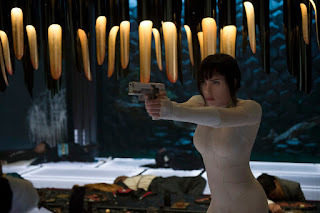 Based on the internationally acclaimed Japanese Manga, "The Ghost in the Shell." Directed by Rupert Sanders. "The line between human and machine is disappearing." What else is new? Ghost in the Shell looks good; but there's no way to overlook its' similarities to Blade Runner, The Matrix and countless others. Like the former, it also lacks soul... despite an admirable, albeit muted performance from Johansson. She may be "a miracle" in a "synthetic shell," but ScarJo has done this before too (Black Widow) and with a lot more flair/personality. That said, there's some very cool moments (digital camouflage, terrorist attack) but not enough to make a lasting impression. For science fiction and ScarJo fans only.